It is important to note that no one nutrient makes sea buckthorn a wonderful choice for health and wellness. Sea buckthorn has so many health promoting properties stemming from it’s vast nutritional profile that singling out any one component, such as the highly coveted Omega-7 fatty acid, is actually doing the super berry a disservice. It’s the synergistic effects of over 190 phytonutrients and active components that make this fruit so beneficial for human health. The high levels of Omega-7 within sea buckthorn have been found to have amazing healing properties for the body, particularly tissue health. It goes deep into the skin to hydrate at a cellular level, while promoting cell turnover, to leave skin soft and supple. But it is not just for the skin; it also rejuvenates and heals tissues inside the body. Omega 7 coats the gastrointestinal tract and reduces inflammation to soothe dietary distress and discomfort while nourishing mucous membranes. Click here to learn more about the benefits of the rare Omega-7. Although this miracle berry is known for having the richest plant source of Omega 7 known in the natural world, it also contains all the other essential fatty acids the body needs: Omega 3,6 and 9. Omega 3 is an essential fatty acid that plays a vital role in brain functioning and may aid in the prevention of cardiovascular disease. The American Heart Association recommends a diet rich in Omega 3 fatty acids. Research on the health benefits of Omega-3 has shown it may be useful for treating or preventing many ailments, such as diabetes, cholesterol, blood pressure, attention disorders, osteoporosis, skin disorders, and some cancers, among others. 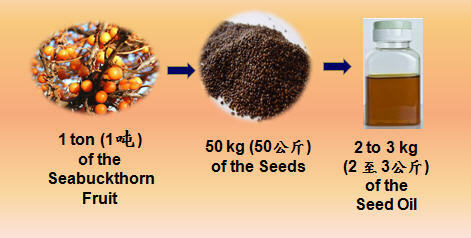 Sea buckthorn seed oil is a potent vegan source of Omega-3 fatty acids. Omega-6 is another essential fatty acid the body cannot produce. It is known to help stimulate skin and hair growth, maintain bone health, regulate the metabolism, and maintain the health of the reproductive system. Omega-9, also present in sea buckthorn oil, is actually produced by the body when there is enough Omega 3 and 6 present for conversion. If there is not enough available, you will need to supplement the body through food and supplements. It plays a role in preventing heart disease and lowering cholesterol levels, as well as reducing hardening of the arteries and improving general immunity. Some of the symptoms of an Omega-9 deficiency are eczema-like skin eruptions, hair loss, dry skin and eyes, and stiff or painful joints. Making up for these deficiencies may explain why sea buckthorn is known to be so effective for these health issues. This powerful source of omegas is the result of a deep extraction process where 1 ton of sea buckthorn is purified into only 2 to 3 kgs of highly potent oil for supplementation! Sea buckthorn is host to a complex network of antioxidants, including Superoxide Dismutase (SOD). SOD is a super antioxidant that repairs cellular damage caused by free radicals. Therefore, it is an effective tool to prevent cancer and age-related damage to the skin and tissues, such as wrinkles. SOD is a powerful anti-inflammatory and helps reduce inflammation in the body that can lead to fibromyalgia and gastrointestinal disorders. 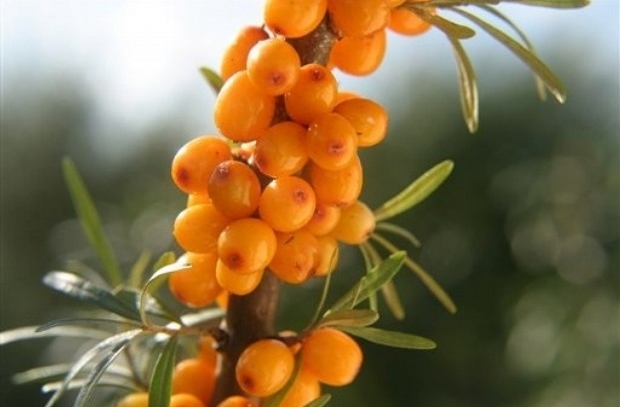 Learn more about sea buckthorn’s many antioxidants here. The rich variety of flavonoids in sea buckthorn have amazing effects on the body. They reduce inflammation (the cause of many illnesses and discomfort), improve cardiovascular health by reducing atherosclerosis, lower cholesterol, and ease allergies. Some flavonoids, including those in sea buckthorn, have been found to reduce the risk of heart attack, stroke and even a variety of cancers! Sea Buckthorn gets its vibrant color from very high levels of Vitamin A, a powerful antioxidant and immune booster that prevents cancer and heart disease. Vitamin A is essential for eye health, preventing cataracts, macular degeneration and glaucoma and keeping eyes functioning properly. It is necessary for the production of dentin to keep teeth healthy and strong and is excellent for tissue regeneration, so it is necessary for wound healing as well as for maintaining healthy skin. Vitamin A is also important for your urinary tract as it prevents the formation of painful kidney stones. Incredibly high levels of Vitamin E, much higher than any other nutrient, in sea buckthorn act as a powerful antioxidant that absorbs and destroys free radicals which, if left unchecked, may lead to cancer. It also protects against heart disease and both prevents and slows the progression of eye problems, such as macular degeneration and cataracts. Sea Buckthorn is not just another essential fatty acid supplement, even though it contains all the known essential fatty acids. It’s a natural fruit source of over 190 EFA’s, vitamins, minerals, phytonutrients, and antioxidants that provide vast synergistic benefits for the body. When considering sea buckthorn as a daily health supplement, look at the big picture. It provides almost everything the body needs and is a nutritional bombshell. Why take fish oil caps when you can take a vegan berry in supplement form that won’t leave you with hiccups or nasty burps and provides far more than just Omega-3 fatty acids. It’s the synergy that counts more than any one nutrient in sea buckthorn. Learn about the sea buckthorn seed oil and berry oil and their differences, this will help you choose which one best suit your needs.